Ag + Open Space achieves its mission via four programs. These programs work together in an integrated manner to ensure the efficient and effective use of Ag + Open Space taxpayer funds, high-quality long-term conservation outcomes, and transparent and clear communication with the public. The Conservation Planning team uses current data, technology and tools to prioritize conservation actions in order to use District funds in the most efficient and effective manner. The District relies on a variety of data sources to support its conservation decisions – ranging from information on habitats and species to agricultural, groundwater, climate and socio-economic data. 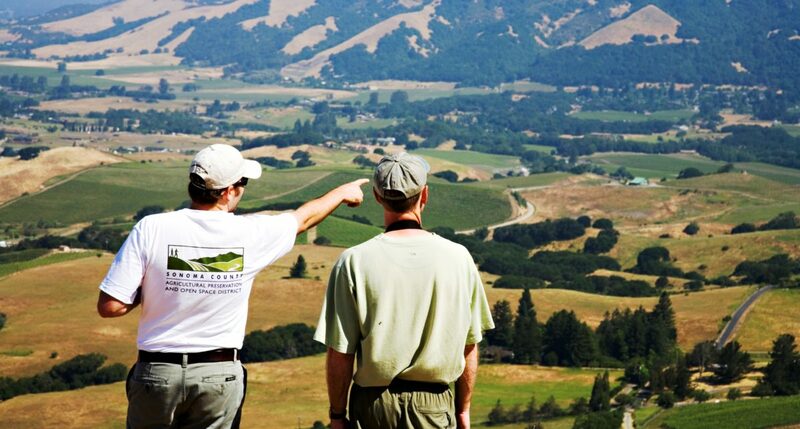 The District has led or participated in various local and regional planning efforts in support of land conservation, including detailed evaluations of habitat connectivity, the Sonoma County Vegetation and Habitat Map and LIDAR program, the Climate Action Through Conservation initiative, Healthy Lands and Healthy Economies. In addition to providing critical information for prioritizing land acquisition, sound planning supports long-term land stewardship and allows the District to leverage its sales tax revenue to attract substantial outside funding. The District is a reflection of the community’s vision and is committed to ongoing engagement with stakeholders. This includes documenting and reporting on the impact of its work and seeking input and suggestions from the community on District priorities and performance. This two way dialogue with the community is accomplished via workshops, meetings, an interactive website, polling and a variety of media – including print, broadcast, and online. The District actively tracks and influences state and national legislation related to agricultural and open space conservation in order to ensure that state and federal policies continue to support the mission of the District and provide funding to leverage local taxpayer investments. The District acquires a partial interest in the land through the purchase or donation of a conservation easement, and the landowner voluntarily limits the future use and improvement of their land. Acquisition Program staff work with each landowner to carefully design conservation easement language that ensures protection of a balance of scenic, agricultural, and natural values and the landowner’s use and enjoyment of their land. These lands stay in private ownership while critical conservation values are protected forever. Since these properties are still owned by private individuals or families, they are not accessible to the public. In some cases the District will hold conservation easements over publicly-owned land, such as a park or open space preserve, which are open to the public. Please refer to our Protected Lands Map to see which properties are publicly accessible. The District acquires land outright with the intent to transfer or resell to another entity subject to a conservation easement. Fee purchase is used primarily to acquire lands for public outdoor recreation where the public use is consistent with the protection of identified scenic, natural, and agricultural values. However, the District can also purchase land and resell the land to a private or public buyer subject to a conservation easement. The District also provides funds to Cities, the County, other public agencies, and non-profit organizations for open space projects through its Matching Grant Program. This program offers funding for land acquisition, development of recreational amenities, and restoration of open space within or near urban areas. It requires applicants to provide at least a one-to-one match and to convey a conservation easement to the District. In addition, the Acquisition Program develops and implements a diverse range of tools for protecting different types of land, such as affirmative agricultural or preservation agreements for agricultural or natural resource protection, and partnerships for recreational lands. Ongoing easement stewardship includes developing baselines, monitoring easements, processing permitted use requests, and employing enforcement actions when necessary. These activities ensure the permanent protection of conservation values, as well as fostering communication and mutual cooperation with easement landowners. The District undertakes natural resource management, infrastructure maintenance, and capital improvements to protect and enhance the conservation values of properties it owns outright. For some properties, detailed management plans have been developed to assess existing resources, identify compatible uses of the land, and develop a set of recommended management actions. Nearly all District-owned properties are currently grazed or are in some other agricultural use. The District is actively transferring fee title ownership of its properties to qualified management entities by selling the properties to private agricultural landowners; or transferring ownership to cities, Sonoma County Regional Parks, State Parks, or other recreational partners. In all cases the District retains a conservation easement to ensure perpetual stewardship of the Sonoma County taxpayer’s investment. In addition to staff stewardship of District lands, the District contracts with local nonprofit and agricultural organizations to provide conservation and agricultural educational programs and outings to connect schoolchildren and the general public to District-protected lands. The District also coordinates volunteer stewardship opportunities on District-owned lands. Entrusted with funds generated from a voter-approved quarter-cent sales tax, the District is committed to the efficient and effective use of taxpayer funds. The District carries out this commitment by ensuring fiscal transparency and accountability, the use of current policies and procedures, and up-to-date technology and tools. 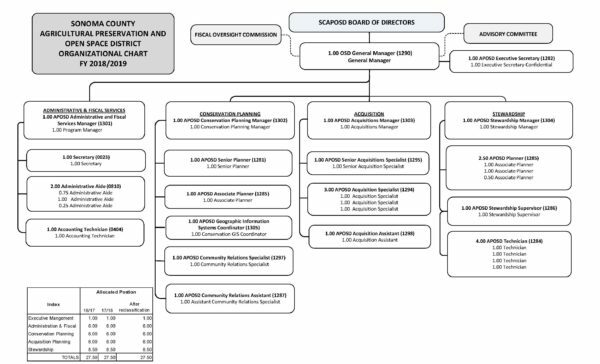 The District’s funds are audited on an annual basis and its annual budget is presented within the County of Sonoma budget. More budget and financial information can be found here.